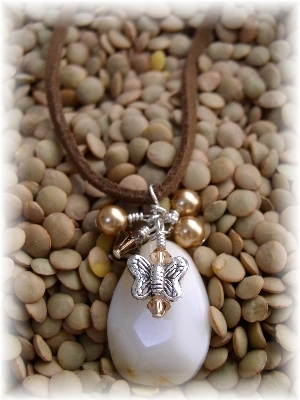 This petite sterling silver�butterfly rests on a piece of smooth white agate.� A natural beauty. This cute casual necklace measures 16". Sterling silver butterfly charm resting on a faceted polished white agate gemstone, adorned by Swarovski crystals and pearls on a brown suede cord.